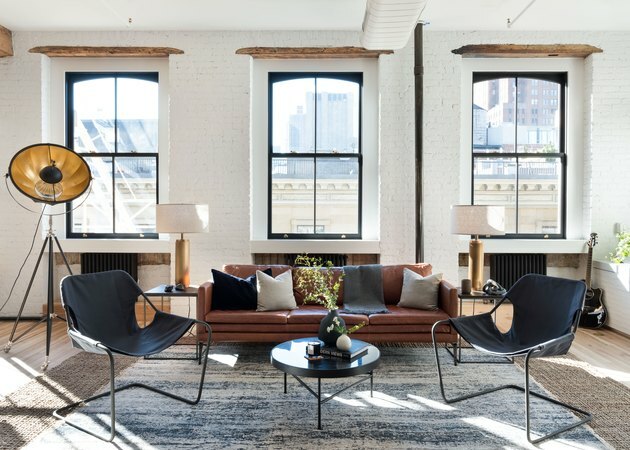 Peeling back the layers on an early 20th century SoHo loft in Manhattan took time, patience, and some creative problem-solving for the interior design team at Becky Shea Design. Shea began the process by accessing the decades of renovations the space had endured. "It was divided into seven small rooms, had lower ceilings, stucco all over the walls ... But we still saw an opportunity and unlimited potential to create a timeless, thoughtfully executed home," she told Hunker. That potential led the team to explore ways to keep certain characteristics (or "moments") of the apartment's past. "It meant enlisting expert restorers to preserve these moments in the right way. Not something many can do," Shea explained. The industrial brick and timber were salvaged; the radiators refurbished. 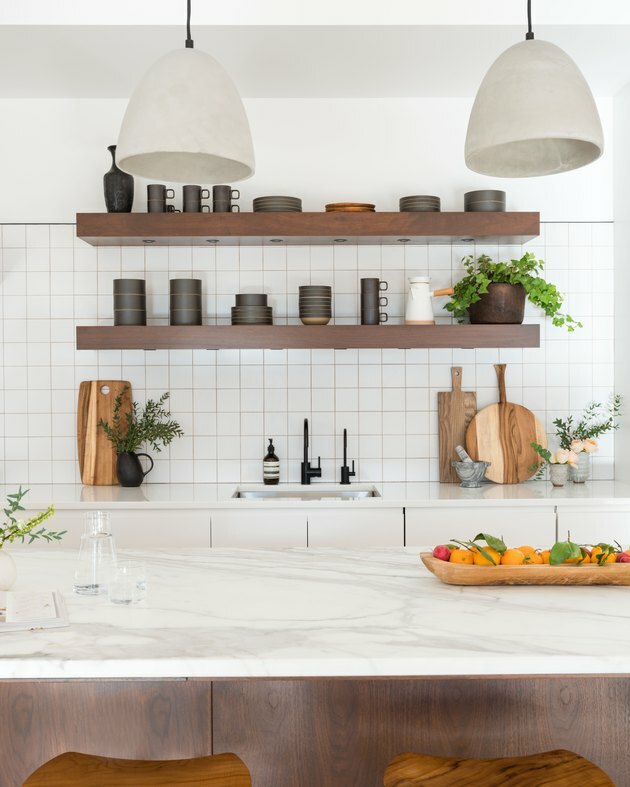 Shea describes the client, Will Nathan, as "dope," and thanks to his interest in the design space (he's a co-founder of Homepolish and the creator of Object Limited, a "shoppable boutique hotel" in Arizona), he "gave us the platform to do what we do best." 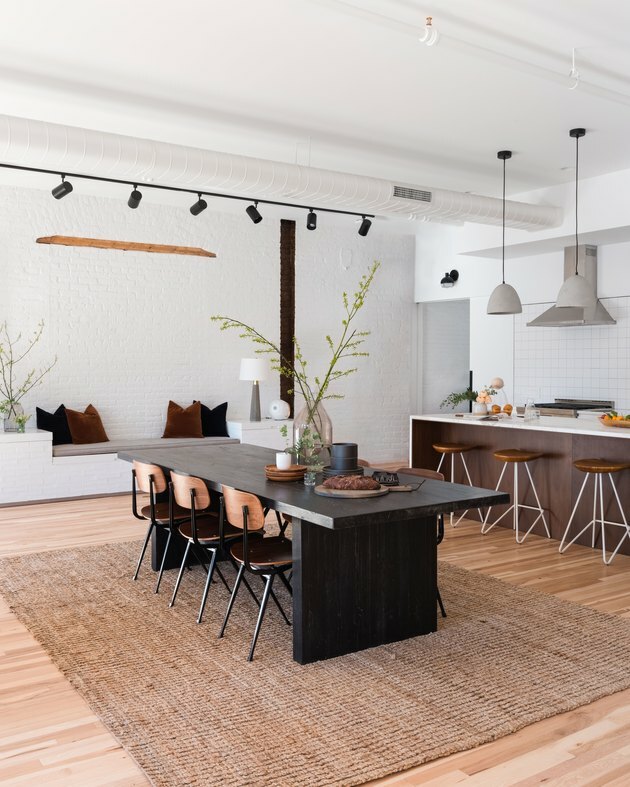 The result is a spacious, open-concept loft that uses the building's original details as a framework for a polished, earthy design. The coffee table was purchased from a Hudson Valley outfit called North American Furniture Company. Custom cushions from Stitchroom add extra coziness to the living room. The blackened steel from Shelton Studios seems to be a nod to the historic cast iron exteriors in SoHo. The black linear elements around the living room complement the warmer tones and natural materials, like the leather sofa from Article. By stripping away layers, Shea discovered burn marks and other "moments" from years past that she knew warranted preservation. Repainted radiators and salvaged materials, such as brick and timber, are a reminder of the apartment's history. A 35-foot bench gives guests ample seating options. 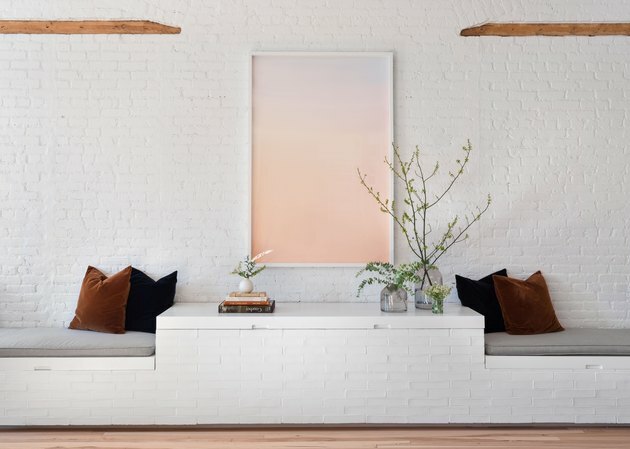 A large painting by artist Jordan Sullivan seemingly floats on the apartment's Benjamin Moore-painted walls. By planning the space beforehand and layering in furniture, the 2,500-square-foot floor plan was transformed into a large but manageable open space. "Folks are intimidated with projects of this scale, but when you start from scratch, no matter the scale, it makes the process and job that much easier," Shea said. In the dining area, a table from Restoration Hardware is surrounded by chairs from Industry West. Another unexpected challenge made the process a bit more difficult for the design team: getting the furniture into the apartment through the eight-foot-tall single-use elevator. "Our Calcutta gold marble slab for the kitchen island was too big to fit in the elevator and the stairs, so we had to boom it in. This required taking an entire window out, and craning the slab five flights up at five in the morning." In the meditation space, vintage rugs from Aelfie, Sharktooth, and the client's own company, Object Limited, are draped over the floors. 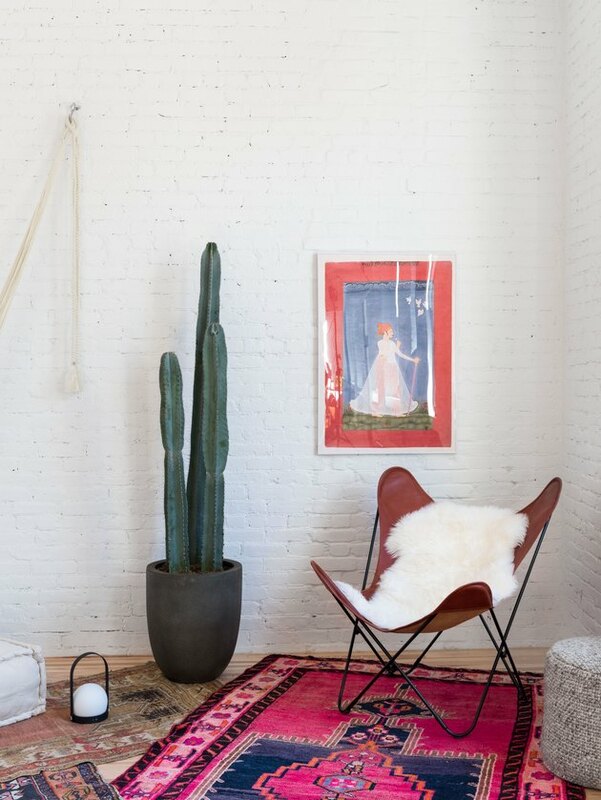 A hammock and Palermo butterfly chair from The Citizenry provide the perfect place to relax. Windows made by Dynamic Window Solutions open up the bedroom. 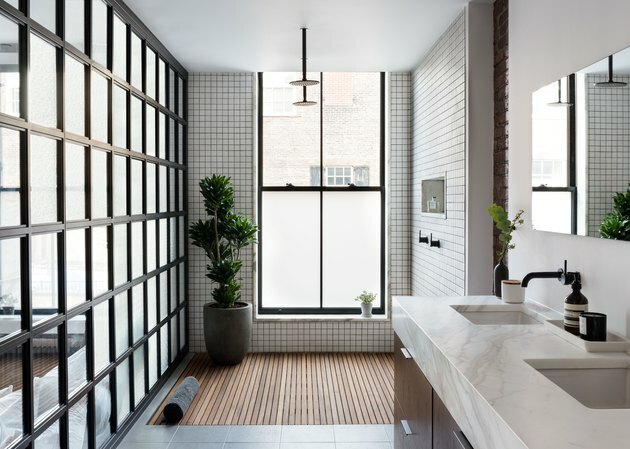 Natural floors by the New York City-based LV Wood Floors & Surfaces are complemented by the steel-frame window wall. Parting with some architectural details was also part of the process. "There were things we loved but couldn't keep," Shea lamented. 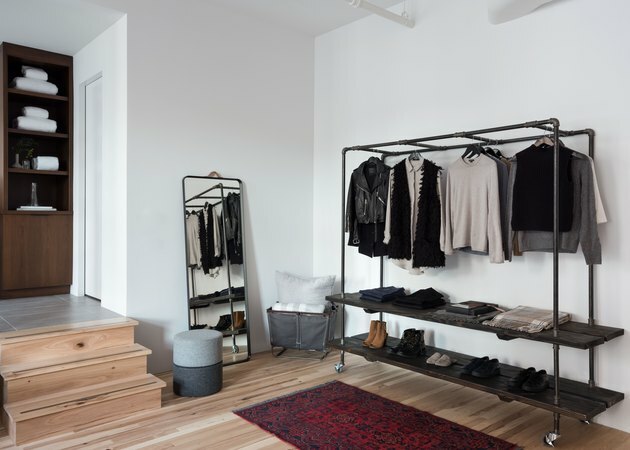 The result is a minimalist style that only features a few key elements, including custom-made furniture — like the bedroom's clothing rack by Soil & Oak. The bathroom fixtures were purchased from Astra Walker. An open shower mimics the spacious structure of the home.